The Football Association and Special Olympics Great Britain gave 10 Brazilian footballers with learning disabilities the opportunity to join the England team for their training session ahead of the team's opening World Cup game in Manaus. The session took place at England’s training base in Rio de Janeiro on Monday (June 9). Ana Paula Soares, national director for Special Olympics Brazil, said: "When I told our 10 players they would be meeting the England World Cup squad in Rio they quite literally couldn’t sleep. "This amazing experience was all thanks to our friends at Special Olympics Great Britain who were supported by the Premier League and the English FA. It was a truly memorable day for the athletes." The group also got the chance to meet and take photos with England manager Roy Hodgson ahead of his team's opening fixture against Italy this weekend (11 June). 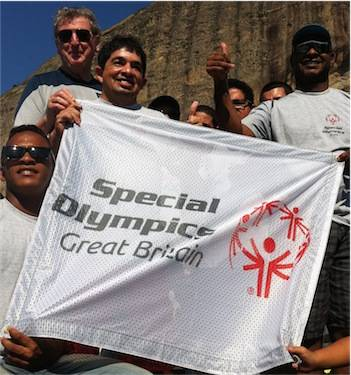 Chris Hull from Special Olympics GB added: "The Premier League kindly gave us the chance to reach out to our colleagues in Brazil and organise this great opportunity on the ground with the England team for athletes with learning disabilities. "Almost 1.2 million people in the UK, or 2% of the population, have an intellectual disability. Special Olympics GB is a registered charity and receives no central funding, so support like this from the Premier League is essential to allow us continue our work for children and adults with intellectual disabilities. I want to thank Adrian Bevington, Joanne Budd and Maria de Leon at The FA for their kindness in facilitating this opportunity for Special Olympics athletes." Elsewhere, Brazil player and Special Olympics ambassador Dani Alves held a coaching clinic for another group of athletes with learning disabilities before his side's victory in the opening game of the tournament last night. Speaking about his role, Alves said: "Football changed my life. It has opened more opportunities for me and has shaped me as a man. As an ambassador for Special Olympics I want to play my part in ensuring that more and more athletes with intellectual disabilities have the chance to transform their own lives through the joy of football, achieving greater things both on and off the pitch. And in turn, they will inspire us all with their courage and spirit."